This program is designed to accompany you throughout your week and unwind each evening for 7 days. Each evening class offers a special mantra, intention setting and accompanying yoga practice to help you tune in, slow down, and recharge. The best part is you can keep revisiting this program each week and you’ll always come away with something new. Take this gift for yourself and change the way you experience your evenings. Start here to learn how to approach this program, what you'll need and what to expect. Happy Monday! Get your mind right and feel empowered for your week ahead. Let's do it! Get ready to face and embrace challenges both on and off the mat. This practice will focus on a series of balancing postures. 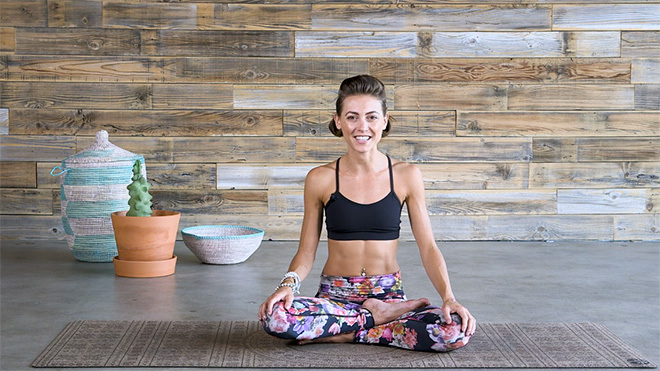 Avoid the mid-week slump with this Moon Salutation Flow for the motivation and inspiration you need to get through the rest of the week. Get grounded, centered and calm with this evening's practice that focuses on cultivating a sense of being grounded and in control. Happy Friday!! Transition into the fun and upbeat attitude of the weekend with this enjoyable Friday flow. Keep the momentum of your weekend going strong with another upbeat practice that's all about gratitude. Replace the 'Sunday scaries' with self-love in this feel-good restorative practice to calm and relax mind + body for your week ahead.